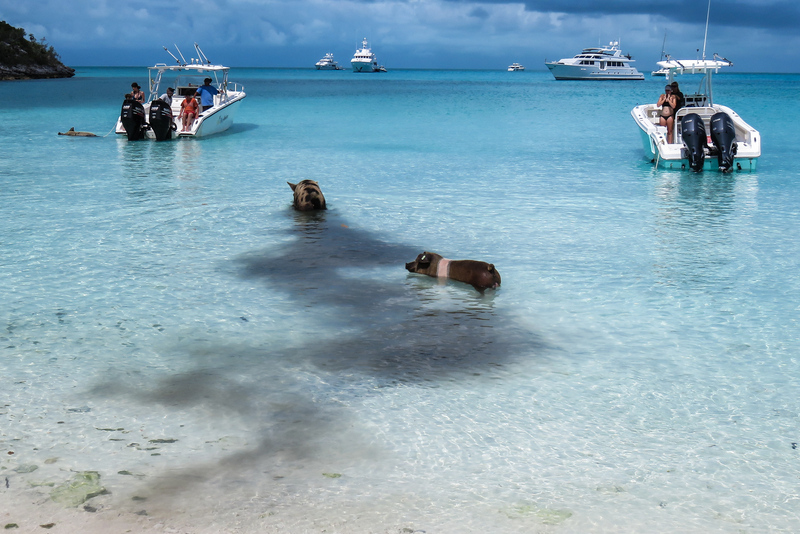 Pig Beach in the Bahamas is home to the famous Swimming Pigs. Now the most popular of the things to do in the Bahamas, the Exuma pigs at Pig Beach are a sight to behold and should be on every visitor’s bucket list. 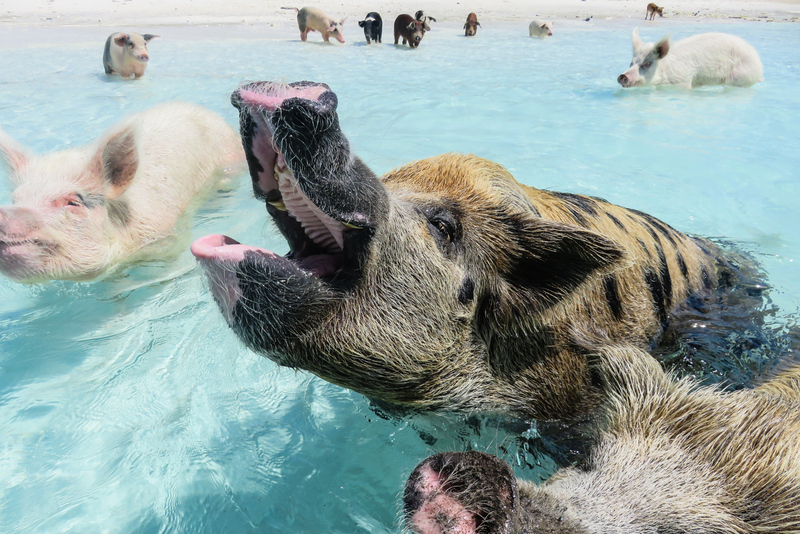 Pig Beach in the Bahamas is home to the famous Swimming Pigs. Now the most popular of the things to do in the Bahamas, the Exuma pigs at Pig Beach are a sight to behold and should be on every visitor’s bucket list. Turquoise blue waters lap the white sand fringes of this remote tropical island getaway in the Exuma Cays. Come with me as I give you the ultimate guide to Pig Beach, Staniel Cay and all things Bahamas Swimming Pigs. Picture a tropical island paradise; crystal clear waters, soft white sand, swaying palm trees? Well, how about swimming pigs? This is now the new top tourist haunt in the Bahamas: the Pig Beach on Big Major Cay Island in the Exuma Cays. 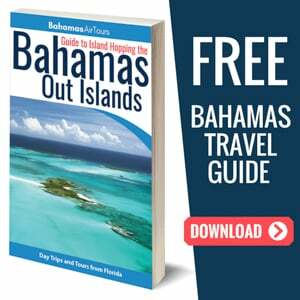 The Exuma Cays are a stunning collection of 365 tropical islands in the Bahamas Out Islands Archipelago. In total there are over 700 islands that make up the Bahamas, but this one island known as Pig Island, is the one island that everyone wants to get to. And it’s not just the famous Bahamas Swimming Pigs that travellers are coming here for, in the wider area of Staniel Cay which is a heavenly tropical paradise there are sharks, turtles, endangered iguanas, tropical fish, underwater caves and a plethora of underwater wrecks to explore. Pig Beach Bahamas is the center of attraction for visitors to Staniel Cay, but this remote Pig Island has no easy or affordable means of visiting. It’s a 3 hour speed boat ride away from Nassau (the capital of the Bahamas and the main tourist hub), or it’s a 30 minute plane ride away. But don’t expect large airliners to be flying this route because the runway at Staniel Cay Airport is so short that the operators have to use small island hooping planes like the Cessna Grand Caravan, Navajo Chieftain or Beechraft 99. 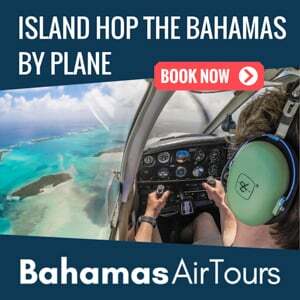 I flew with Bahamas Air Tours from Nassau to Staniel Cay by plane. 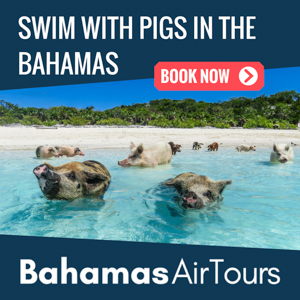 I’ve also taken the journey from Miami too, Bahamas Air Tours offers Bahamas Day Trips to Pig Beach from Florida by private plane! 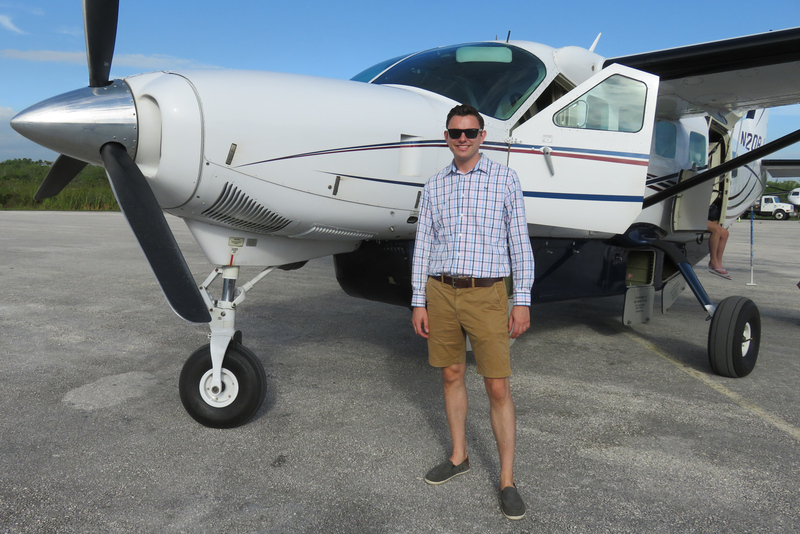 Flying in one of these small planes into Staniel Cay Airport is an amazing experience. No queuing at the airport for check-in because they fly from the private executive airport terminal’s so it’s straight out to the aircraft fitted with large windows and plush leather seats. 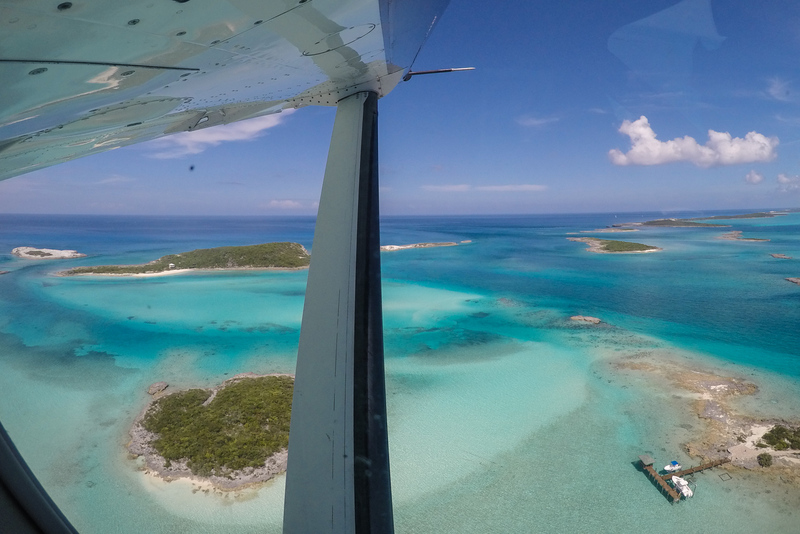 It’s a stunning sight to behold: flying down the chain of Exuma Islands and the panoramic views across the island archipelago are simply stunning! It’s defiantly the way to get to Pig Beach Bahamas and I would highly recommend booking your Pig Island Tour with Bahamas Air Tours. If you will be staying in Nassau then you should book a Nassau to Exuma Day Trip. The only other way to get to Pig Beach is by boat and it’s a 3 hour powerboat ride from Nassau. The boat tours are frequently cancelled out of Nassau if the winds are too strong because the powerboats have to cross an open stretch of water that would otherwise be too rough and dangerous to cross. The Bahamas Pigs can smell that I have food on the boat! Pig Beach is located on the north western shoreline of Big Major Cay an uninhabited island in the Exuma Cays. Pig Island is adjacent to Staniel Cay which is where the nearest airport is located: Staniel Cay Airport. Pig Island and Big Major Cay is one of 365 islands that make up the Exuma Cays archipelago. From Staniel Cay it’s about a 10 minute boat ride away to reach Pig Beach Bahamas which is sandwiched between Fowl Cay and Thunderball Grotto. Fowl Cay has a private resort with space for only around 40 guests it is a luxurious getaway currently run by the Sandals Resorts group. Thunderball Grotto is the famous James Bond Cave where they filmed the Thunderball film at. You’ll approach Pig Beach by boat as it’s the only way to get there. 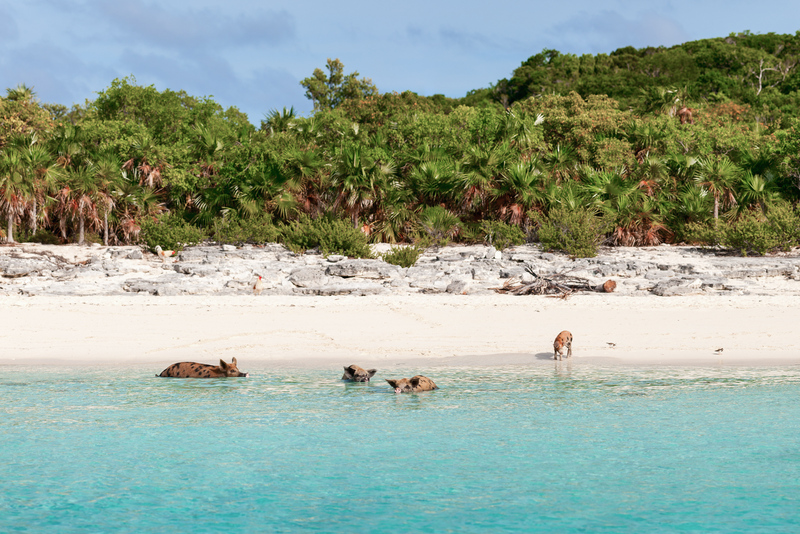 As your boat pulls into the secluded bay that surround Big Major Cay island you’ll be able to make out these famous Bahamas Pigs dotted along the beach. Once they hear the motor of the boat they normally stride into the water and begin swimming towards you! Some of the smaller pigs are actually really athletic swimmers. I’ve seen one small pig swim at least 200 meters off Pig Beach to a super yacht in search for food! However the type of show that the Bahamas Pigs put on for you will differ depending on how crowded pig beach Bahamas is. I’ve visited at many times of day and the mornings and late afternoons are certainly the best and less crowded times to plan your visit to Pig Beach. I’ve included photos of Pig Beach further down this article that compare how busy the beach is at different times of day. The problem is that once the beach gets crowded with tour boats the Bahamas Pigs are less likely to get into the water and swim to you. They suddenly become very lazy since all the tourists are bringing with them food direct to the beach. And this creates the second problem for visiting Pig Beach: The Bahamas Pigs can get quite aggressive, especially when it’s crowded. If you’re on a Pig Island Tour then you should have an experienced guide who will show you that if you’re approached by a pig and you don’t have any food on yourself, you should raise your hands with palms open. The swimming pigs seem to understand these gestures to mean that you don’t have any food and they will leave you alone! What is there to do at Pig Beach Bahamas? Located at the southern end of Pig Beach is a small pavilion building that provides a home and shelter for the pigs. It’s well stocked with fresh water that is collected by ducting on the building’s roof. There’s a recently contracted pig pen and feeding troughs now. 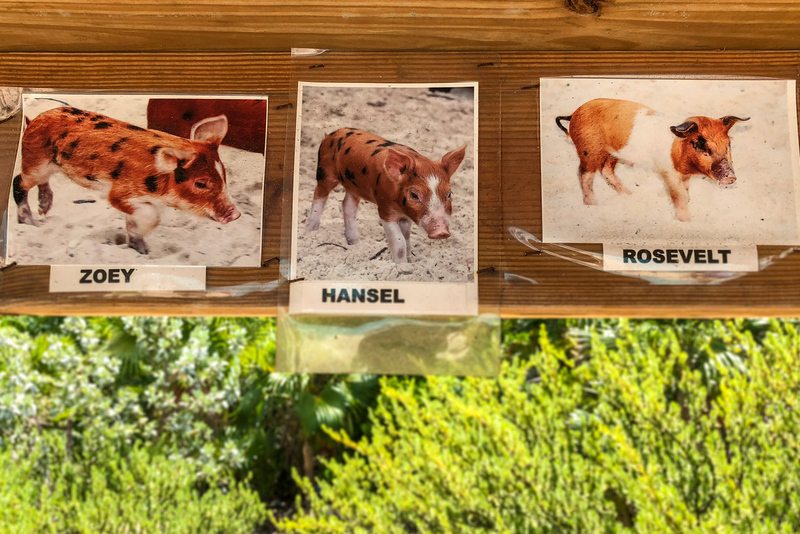 If you venture inside the Pig Beach pavilion you will find the inside adorned with named photos of each pig. 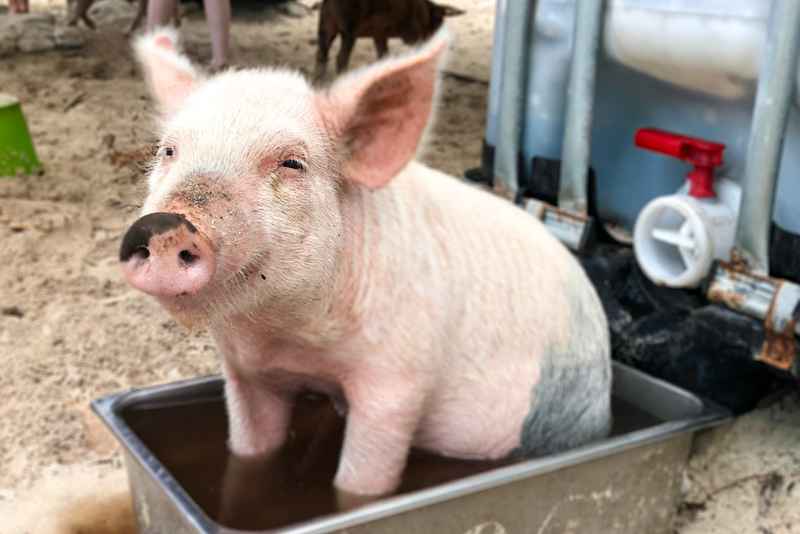 There are other animals, apart from pigs on the hall of fame photo gallery, but I won’t spoil the surprise for you, you’ll have to visit Pig Beach yourself to find out. The Bahamas Swimming Pigs have names! I’ve visited Pig Beach now 2 years in a row. It’s amazing how much the family of pigs have changed between my visits. 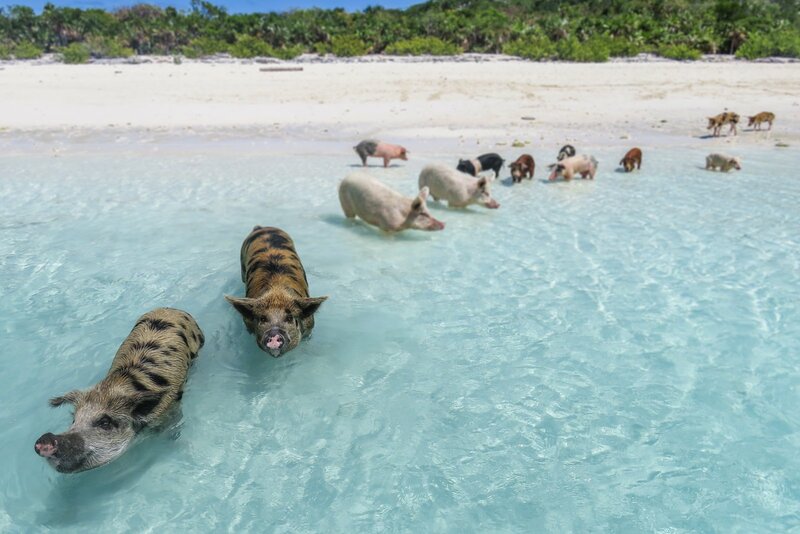 The number of pigs has certainly increased, despite accusations of theft by islanders accusing other islands of stealing them to create other “swimming pigs” tourist attractions on other islands! There are lots more younger pigs now. And there’s still Big Mamma, the largest and oldest of all the Bahamas Pigs! 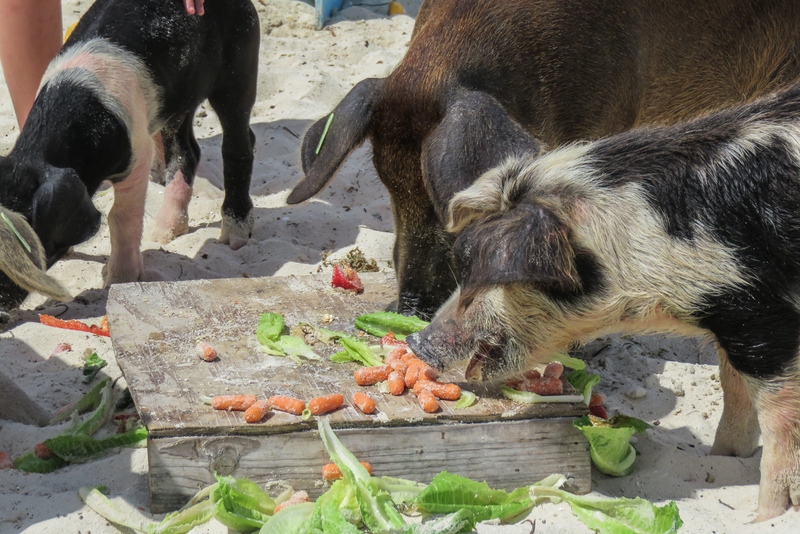 The Bahamas Pigs are well looked after by locals and tour operators alike. 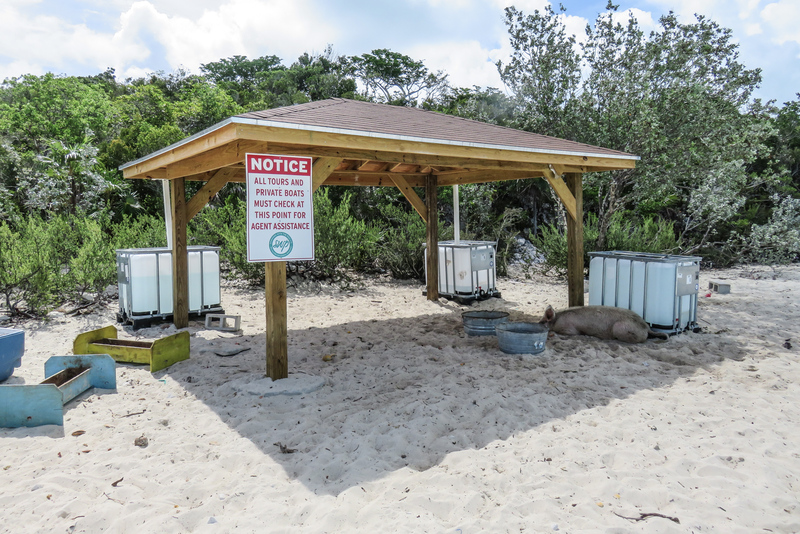 They appear to have an abundant supply of food, and the signage around Pig Beach makes it clear that you should only feed the pig fruits, vegetable or bread; No citrus or kitchen scraps allowed! You are encouraged to feed the pigs from your boat, to encourage them into the water rather than dropping food on to Pig Beach. A final warning, is not to put your hands or try to feed the pigs directly into their mouths, they will bite! Why are there swimming pigs in the Bahamas? 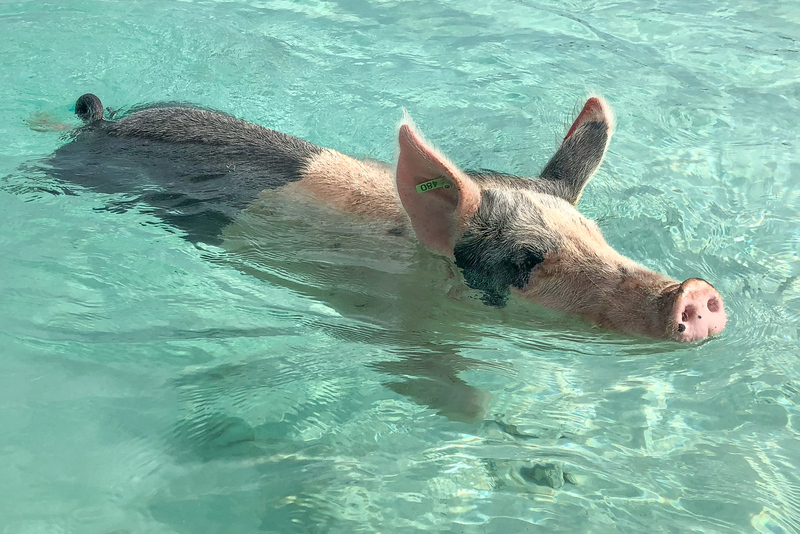 So one of the questions that remains to be answered is why are there swimming pigs at pig beach Bahamas, where did they come from and why did they start swimming? Its an interesting question that I’ve posed to a number of Pig Island Tour guides and locals that has elicited some colourful stories and history of Staniel Cay and Big Major Cay. One of the stories is that Sailors brought the pigs to pig beach with the intention of eating them. But the sailors left and never returned to collect their pigs again. Another colourful story is that the Exuma Pigs were being transported by a ship crossing the Bahamas Sea. The ship was shipwrecked in a storm and the pigs then swam to shore to setup home on Pig Beach! I’ve spoken to a number of locals and Captain Dave has given me the best account that explains their existence. Staniel Cay was originally a farming community and so the local farmers decided to put the pigs over on Big Major Cay which is the island adjacent to Staniel Cay. They did this because of the bad smells the pigs gave off. Captain Dave tells me that when he was a kid his parent would send him and his siblings out by boat from Staniel cay across the water to Big Major Car, Pig Beach where the pigs were to feed them. But one day as they approached pig beach the pigs were swimming out to him. They’d never seen that before! Swimming Pigs!! They must have begun to understand that Dave’s boat equalled food so swimming was there way of intercepting the food before it reached the beach. Dave fondly remarks how they told their parents that the pigs were swimming and were swiftly given a beating for telling their lies! It wasn’t until his parents visited the pig beach that they too saw for themselves the swimming pigs! When is the best time of day to visit Pig Beach? Its now the hottest tourist attraction in the Bahamas, if not the Caribbean. So quite rightly you want to get some Instagram picture perfect shots of pig beach and the swimming pigs. So when is the best time to visit Pig Beach Bahamas? If you go in the middle of the day from around 11am through to 2pm it gets very busy because this it the time when all the powerboats from Nassau arrive (it takes them around 3 hours to cross the Bahamas Sea from Nassau). SO if you can I would strongly recommend you avoid coming during this peak time period. If you come to visit Pig Beach early in the morning or late in the afternoon then you’ve got the best chance of avoiding the crowds. In fact I would say you have a very good opportunity to have the entire Pig Beach to yourself! 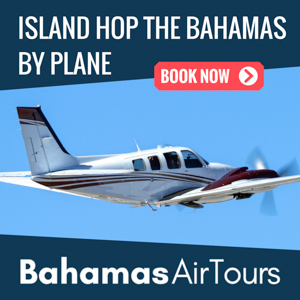 My recommendation would be to do the Pig Island Tour by plane with Bahamas Air Tours, don’t take the boat from Nassau. If you fly from Nassau to Staniel Cay then you can beat the powerboat tours. 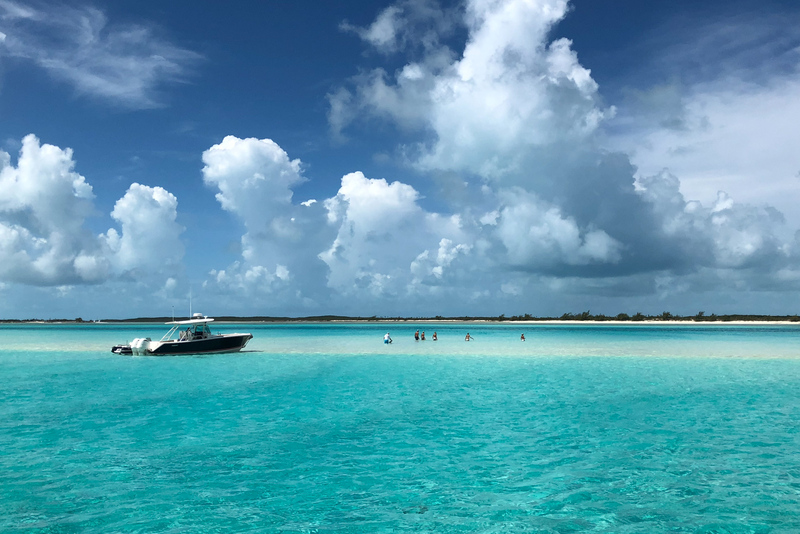 This means you can stroll onto pig beach at 9am in the morning and have the whole pig island to yourself, whilst the power boat tours are doing the bumpy sailing across the Bahamas Sea! When is the best time of year to visit Pig Beach? The Bahamas Peak season is from December through to April and then July to August. If you visit during the peak season then it’s inevitable to get crowds and lots of tours visiting pig island. But even if you visit during the peak season, if you schedule your Pig Island Tour to visit pig beach during the quieter times of day (early morning or late afternoon) I would strongly recommend that. Pig beach is just one of the attractions at Staniel Cay. I think the whole area is of such astounding beauty that it doesn’t matter where else you go; in every direction you will be immersed in turquoise waters and white sandy beaches. But there is far more to here than just Pig Beach. There are the Sand Bars sat Pipe Cay, the nurse pet sharks at Compass Cay, the famous Thunderball Grotto from the James Bond 007 film Thunderball, the endangered Bahamas Rock Iguanas at Bitter Guana Cay and the many underwater plane and ship wrecks that litter this area of the Exuma Cays. The sand bar is a real example of paradise and one of my favourite features of Staniel Cay. 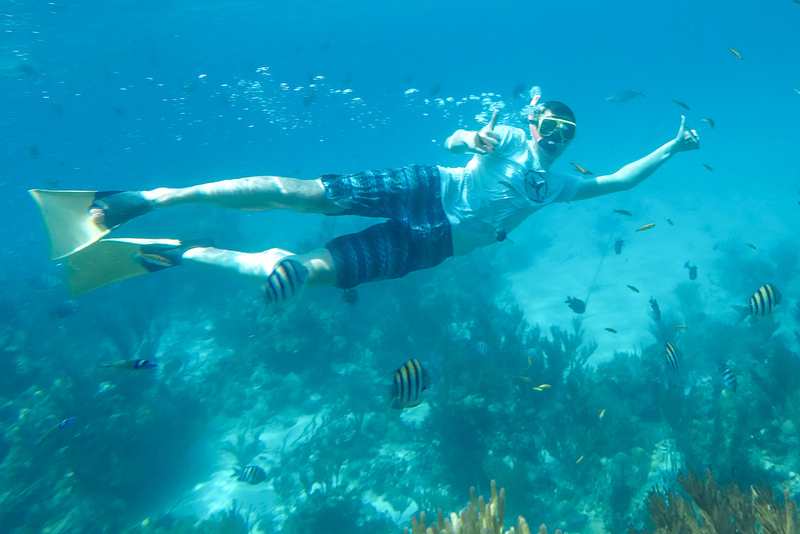 There are many underwater snorkel spots also, the best of these is known at the Aquarium and is adjacent to Johnny Depp’s private island! The Aquarium is full of tropical fish, it’s where it get’s it’s quite literal name from. You can sometimes encounter green sea turtles here also. 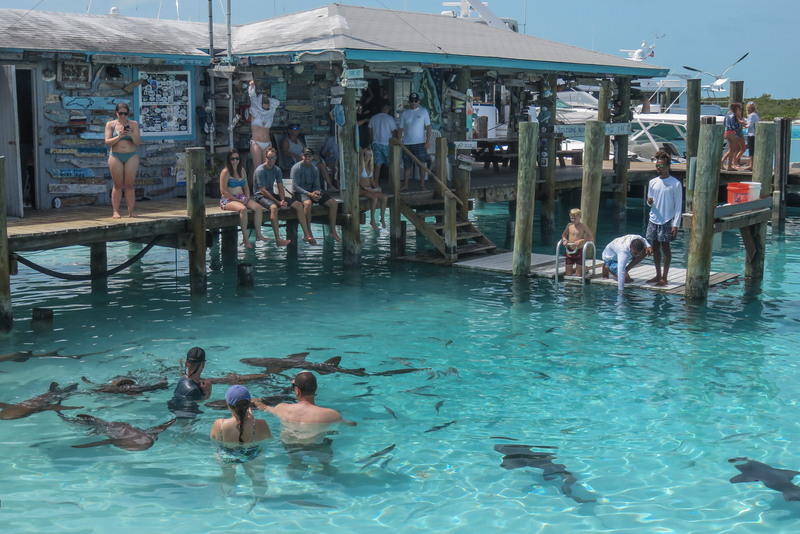 However, the top sight apart from Pig Beach has to be Compass Cay and their pet nurse sharks. It’s not my favourite of all the Staniel Cay sights because it gets over crowded. The nurse sharks that live here, according to National Geographic, are mostly Harmless to Humans. If you put your fingers in their mouths, internationally or not, they will take a bite! It’s their natural instinct. As the popularity of Compass Cay Sharks keeps increasing then these types of incidents will keep happening. There have been quite a few high profile news stories of visitors sustaining injuries. My advice is follow the guidance of your local guide and you’ll have an amazing time whilst keep all your fingers in tact! Compass Cay is located about 20 minutes by boat north of Pig Beach. You’ll pass the sand bars at Pike Cay on the way to the entrance of the Compass Cay Marina which is where you visit the Sharks. Which Pig Island Tour should you choose to visit Pig Beach? 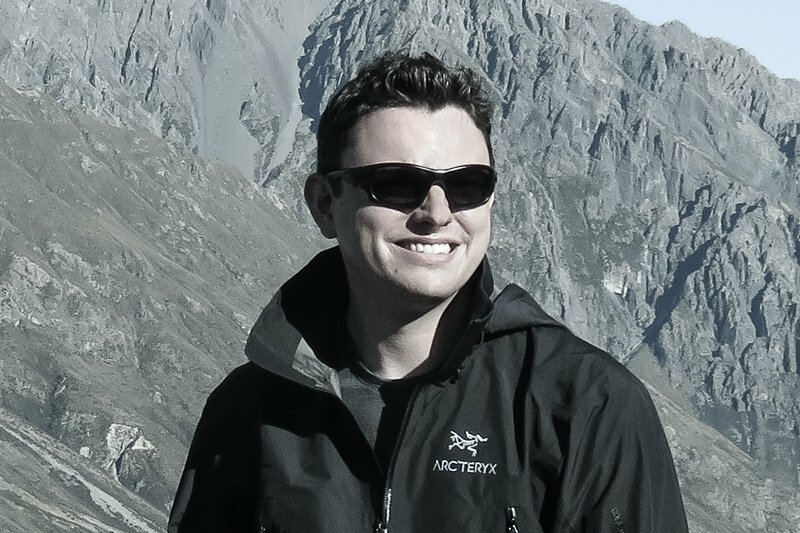 There are really only 2 different tour options. Tour by powerboat or tour by plane with boat. The Powerboat rides start in Nassau or Georgetown Exuma. Its around 3 hours boat ride from Nassau to Staniel Cay and around a 1 an half hour boat ride from Geoergetown Exuma. The best Pig Island Tour option is to take flight option. It’s only a 30 minute hop from Nassau versus the long boat ride. You get there ahead of all the powerboat tours which means you get to see all the sights ahead of the crowds. You also get stunning views of the Exuma Cays archipelago on the flight form Nassau to Exuma. The panoramic views of the turquoise seas is really a sight no to be missed, although perhaps I am biased because I am a pilot writing from Flying and Travel. 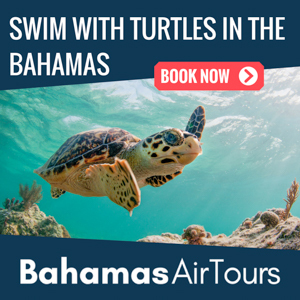 But the reason with the greatest value to take the plane over the boat is that you’ll have a full day tour of Staniel Cay where you can visit the Sharks, Iguanas, Thunderball Grotto, Plane Wrecks and Sand Bars. 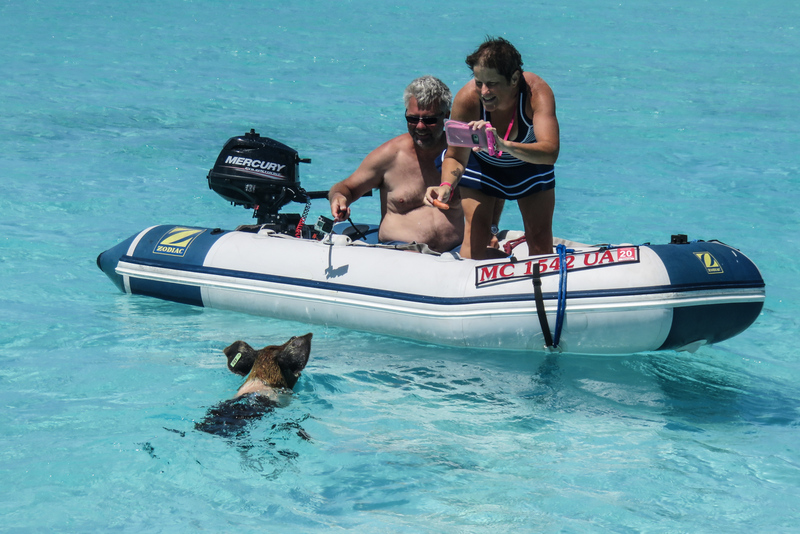 On the powerboat tours from Nassau they only stop at the Sharks and Pigs, so the Pig Island Tour by plane is so much better value considering the price for each tour is not too dissimilar. 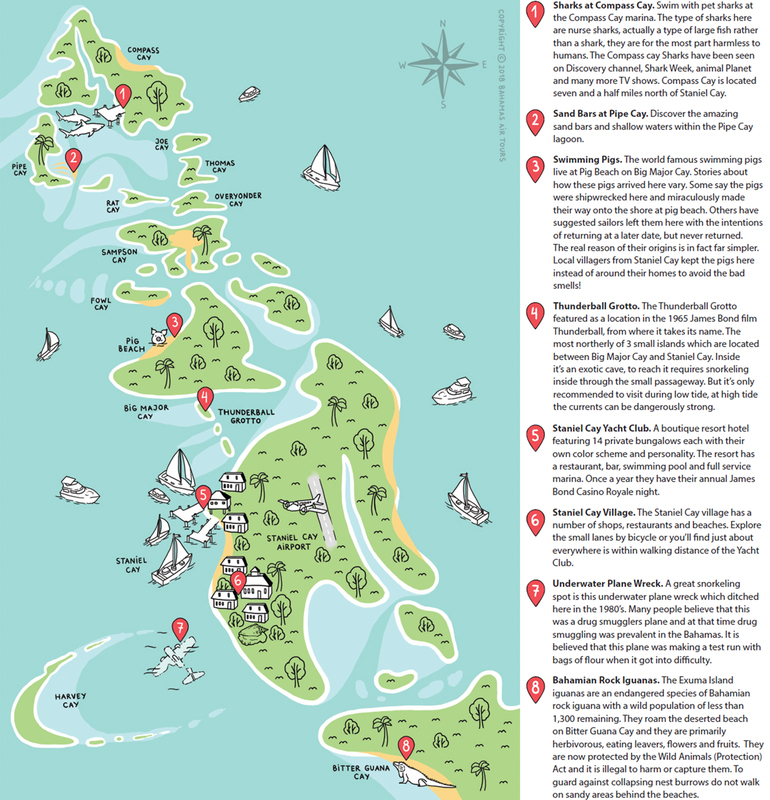 Below is a map of Pig Beach and the Staniel Cay area which better shows the attractions and sights not to be missed on your Pig Island Tour! 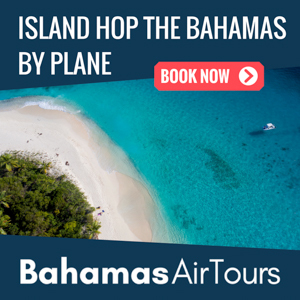 If you like the idea of visiting Pig Beach by plane then have a look at the Bahamas Day Trips and Tours on offer with Bahamas Air Tours. They operate day trips to Bahamas by plane form Nassau and Miami. 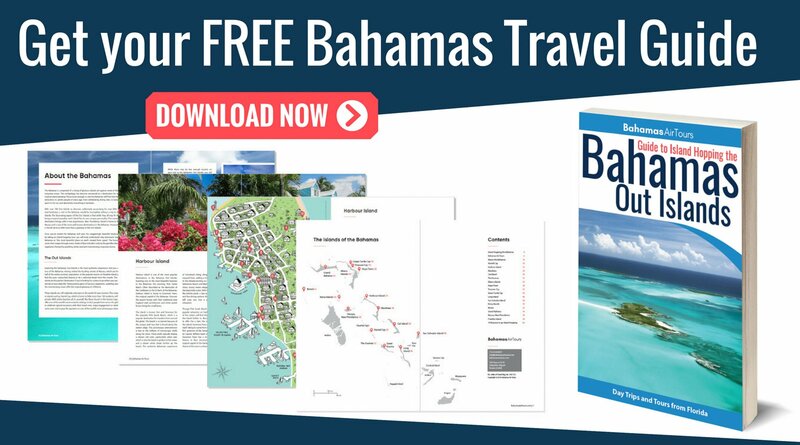 So even if you’re visiting the Bahamas on a cruise and your stopover in Nassau isn’t long enough to make the day trip then you can take the Staniel Cay Day Trip from Miami before or after your cruise.